The visitor to Metro Manila commonly sees the Philippines as the most westernized of Asian countries and in many ways, it is. But there is also a rich underlay of Malay culture beneath the patina of Spanish and American heritage. National cultural life is a happy marriage of many influences, as the indigenous Malay culture is assimilated and adapted to different strains in a practice typical of Malay temperament. An upsurge of Philippine nationalism stimulated a desire to preserve the ancient heritage without restricting its openness to foreign artistic influence. The Philippines is an archipelago of 7,107 islands. It stretches from the south of China to the northern tip of Borneo. The country has over a hundred ethnic groups and a mixture of foreign influences which have molded a unique Filipino culture. Before the Spanish explorers came, Indo-Malays and Chinese merchants had settled here. In 1521, the Spaniards, led by Ferdinand Magellan, discovered the islands. The Spanish conquistadores established a colonial government in Cebu in 1565. They transferred the seat of government to Manila in 1571 and proceeded to colonize the country. The Filipinos resisted and waged Asia's first nationalist revolution in 1896. On June 12, 1898, Emilio Aguinaldo declared the Philippines independent from Spain and proclaimed himself president. After ruling for 333 years, the Spaniards finally left in 1898 and were replaced by the Americans who stayed for 48 years. On July 4, 1946, the Americans recognized Philippine independence. The Philippines is the third largest English-speaking country in the world. 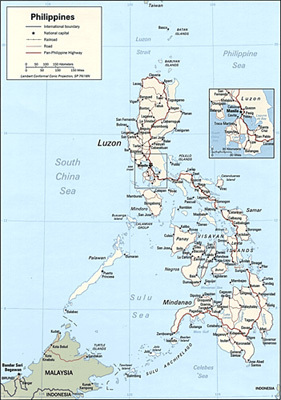 The country is divided into three geographical areas: Luzon, Visayas, and Mindanao. It has 17 regions, 81 provinces, 118 cities, 1,510 municipalities, and 41,995 barangays. (Barangay - The smallest political unit into which cities and municipalities in the Philippines are divided. It is the basic unit of the Philippine political system. It consists of less than 1,000 inhabitants residing within the territorial limit of a city or municipality and administered by a set of elective officials, headed by a barangay chairman or punong barangay). Data as of December 2006. The Philippine archipelago is geographically located between latitude (approximately) 4o23'N and 21o25'N and longitude (approximately) 112oE and 127oE. It is composed of 7,107 islands, with a land area of 299,764 sq.kilometers. Its length measures 1,850 kilometers, starting from the point near the southern tip of Taiwan and ending close to northern Borneo. Its breadth is about 965 kilometers. Bounded by the South China Sea in the West, The Pacific Ocean to the East, the Saul and Celebes Sea to the South, and the Bashi Channel to the North. The Northern most tip of the country is 241 Kilometer south of Taiwan while the southernmost tip is just 14.4 kilometer North of Bormeo. The Philippines is an archipelago of some 7,107 islands. It has a land area of about 300,000 square kilometers and a coastline of 36,289 kilometers. It is divided into three major island groups: Luzon in the north, Visayas in the center, and Mindanao farther down in the south. Strategically located in the Asia Pacific region, the Philippines is readily accessible from the major travel centers of the world. Travel time from Hongkong to Manila is an hour and 20 minutes. From Singapore, 3 hours; Bangkok, 3 hours; Tokyo, 3 hours and 35 minutes; Sydney, 7 hours and 40 minutes; London, 14 hours; Frankfurt, 14 hours; San Francisco, 11 hours and 50 minutes. Manila is the country's capital and main port city and Cebu, in the south, is the second international gateway. The Philippines has two very different climate zones. In the coastal and lowland areas there's a typically tropical marine climate: hot and humid throughout most of the year. In the highest elevations of 1200 meters and above in various provinces the climate can be expected to be cold. Generally the Philippines have a tropical climate with relatively abundant rainfall and gentle winds. There are three pronounced seasons: the wet or rainy season from June to October, the cool, dry season from November to February, and the hot, dry season from March to May. The two main seasons are wet and dry; the dry season from mid-November to mid-May from November to the end of February enjoying cool, ocean breezes with March to May with being the hottest, up to 38C and the wet season from June to October being hot and humid. January is usually the coldest month with an average temperature of 25.5°C (78°F), while April and May are the hottest from 28°C (83°F) up to 38C (100 F). April and May though very hot, Rainfall varies, but most places south of Luzon get rain year-round. Typhoons are prevalent in Rainy Seasons. Temperature in Manila ranges from 21°C to 32°C with a 27°C average. average humidity 77%. The coolest month is January and the warmest is May. Both temperature and humidity levels reach the maximum in April and May, but these are generally good months for aqua sports and mountain trekking. Some of the most colorful festivals are held during these months. The Filipino is basically of Malay stock with a sprinkling of Chinese, American, Spanish and Arab blood. The Philippines has a population of 76.5 million as of May 2000 (with a projected population of 88.7 million for 2007), and it is hard to distinguish accurately the lines between stocks. From a long history of Western colonial rule, interspersed with the visits of merchants and traders, evolved a people of a unique blend of east and west, both in appearance and culture. The Filipinos are divided geographically and culturally into regions, and each regional group is recognizable by distinct traits and dialects - the sturdy and frugal Ilocanos of the north, the industrious Tagalogs of the central plains, the carefree Visayans from the central islands and the colorful tribesmen and religious Moslems of Mindanao. Tribal communities can be found scattered across the archipelago. The Philippines has more than 111 dialects spoken, owing to the subdivisions of these basic regional and cultural groups. Some 80 percent of the population is Catholic, Spain's lasting legacy. About 15 percent is Moslem and these people can be found basically in Mindanao. The rest of the population is made up mostly of smaller Christian denominations and Buddhist. The national language is Filipino although there are at least 87 regional languages. English, widely spoken and understood, is the language used for most business and legal transactions. Hokkien, Cantonese, and Mandarin are spoken by older members of the Filipino-Chinese community. Eight (8) major dialects spoken by majority of the Filipinos: Tagalog, Cebuano, Ilocano, Hiligaynon or Ilonggo, Bicol, Waray, Pampango, and Pangasinense. The country has one of the most highly educated populations in Southeast Asia with a literacy rate of 94.6%. English is widely spoken and understood, and is used extensively in business, government, and education. The political system in the Philippines takes place in an organized framework of a presidential, representative, and democratic republic whereby the president is both the head of state and the head of government within a pluriform multi-party system. This system revolves around three separate and sovereign yet interdependent branches: the legislative branch (the law-making body), the executive branch (the law-enforcing body), and the judicial branch (the law-interpreting body). Executive power is exercised by the government under the leadership of the president. Legislative power is vested in both the government and the two-chamber congress -- the Senate (the upper chamber) and the House of Representatives (the lower chamber). Judicial power is vested in the courts with the Supreme Court of the Philippines as the highest judicial body. Local governments are similar to the executive branch in structure and function. Provinces are headed by governors; cities and municipalities by mayors; and the barangays, locally organized communities, by barangay chairpersons. Chief of state: President Gloria MACAPAGAL-ARROYO (link : http://www.op.gov.ph/)(since 30 June 2004) and Vice-President Noli de Castro)( link:http://www.ovp.gov.ph/)(since 30 June 2004); note - the president is both the chief of state and head of government. Cabinet: Cabinet(link to be provided)appointed by the President with the consent of the Commission of Appointments' (link to be provided)elections: president and vice-president elected on separate tickets by popular vote for six-year terms; election last held 16 May 2004 (next elections to be held on May 2010). Supreme Court (http://www.supremecourt.gov.ph/)(justices are appointed by the president on the recommendation of the Judicial and Bar Council and serve until 70 years of age).